Let me see, which one do I want to play with?!? Dude, I am pooped. Time for a nap! Whatcha' Doing? Want to play Fetch? Car Ride? Fetch? A few more pictures of Moriarty. 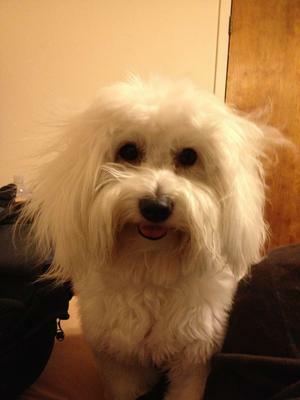 Has anyone trained their Coton to retrieve? Moriarty was reluctant at first when he was a puppy and I was getting him used to playing with toys but when he realized he got affection for bringing that squeaky ball back he hasn't stopped! I get up in the morning, play fetch before I leave. Come home from work, there he is throwing the ball under my feet until we play fetch. 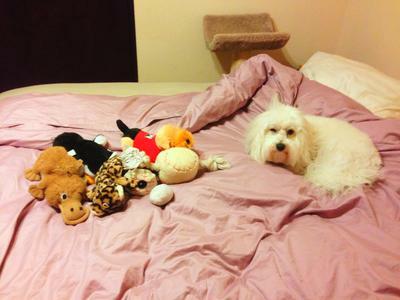 About 8-9PM, about an hour before bedtime, he starts bringing out ALL the toys because he can't decide if he wants a squeaky ball or a you he can play fetch and tug-o-war with. Oh more wonderfully cute pictures. He has those beautiful eyes like onah also. Yes I too can look around my house & see toys and I would not have it anyther way. I am the luckiest person in the world 2 hve Jonah in my life. YES, Cotton loves to fetch, she does not like balls though. She brings various toys of all sizes to me after dinner in the evening when I come in and sit down. This is another little routine of hers. She has several balls but never has shown any interest in them. Moriarty is just so cute, aren't we lucky people to have these gems? 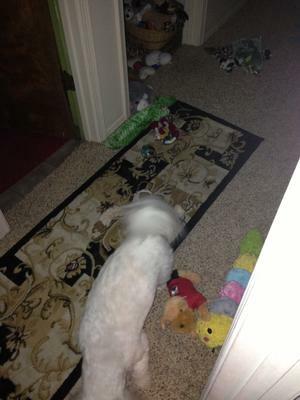 Have to laugh when I see all these toys on your floor. I have said many times it looks like we have little kids around.....But guess we kinda do. While cleaning it is amazing where I find some of their toys. They remind me of little squirrels hiding their treasures.